This Saturday, Claude Puel's Leicester play host to West Ham as the Hammers travel up from London to visit the King Power Stadium. Leicester have fared better in the Premier League so far this term, they're five points ahead of West Ham in the table. Sitting in 14th, three places below the Foxes, Manuel Pellegrini's side will look to earn themselves only their third win of the season. Both teams come into the game fresh from back to back league defeats. ​Leicester City have looked relatively steady this season, but with four wins from nine this isn't going to be a season where they push for anything higher than seventh spot at best. They have, however, lost their other five matches; failing to draw even once. They come into the game having lost their last two fixtures, but before that were on a run of three wins in all competitions. It's hard to know what to expect from Leicester this season - maybe part of the problem is that it seems like they're not so sure either. ​West Ham's form is a little like Leicester's, but a bit worse. Like the Foxes they've lost their last two Premier League fixtures, and like the Foxes, they were on a good run of form before that. This is a West Ham side that's shown glimpses of real quality - they thumped ​Manchester United 3-1 not so long ago. But it's also a West Ham side that has looked unconvincing at times - they lost their first four games of the season. They have two wins, a draw and six losses this season; but as mentioned before, four of those losses came right at the start of the season. It's been a period of transition for West Ham: bringing in a different manager and a host of new players over the summer, on top of the recent stadium change. The lack of consistent form is somewhat understandable, but they'll need to start picking up points on a regular basis if they want to keep fans satisfied. Those who watch Declan Rice on a regular basis will insist he brings calm and composure to the heart of West Ham's midfield. This allows the other attacking players to flourish whilst he also provides his team with extra defensive cover. The youngster's solid Premier League performances have left him declared as one of Ireland's most promising talents in years. The only issue, Rice seems to be prefer the idea of playing for England instead. This won't bother the West Ham fans too much though. They'll be far more concerned with him tethering down creative playmaker, and full England international, James Maddison during the weekend's clash. Maddison has starred in the early stages of the season for Leicester, and seems to have already made himself their most important player going forward. Picking up the ball in the spaces between opposition midfield and defence, Maddison can dribble, pass, or shoot - in an attacking sense, he really doesn't have a weakness. One man has played for England at international level, the other seems to have decided he wants to do just the same. If the England hopeful, Rice, can stop the England international, Maddison, finding his stride, Leicester might just struggle to create - especially with the expected absence of ​Jamie Vardy. Leicester look like they might be without leading man ​Jamie Vardy, who hobbled of the pitch against Arsenal in the latter stages with a stomach problem that he doesn't seem to have fully recovered from. Demarai Gray is also a doubt, with an ankle injury, whilst captain Wes Morgan is still suspended and won't return until the third of November. West Ham lost ​Andriy Yarmolenko to a horrible achilles injury last weekend, and it looks as though he'll be out for the long term. This comes as a blow to the hammers who are also missing the likes of Lanzini, Carroll, Sanchez, Wilshere, Obiang, Reid, and quite possibly Masuaku as well. ​Leicester City ​Schmeichel; Chilwell, Evans, Maguire, Amartey; Albrighton, Ndidi, Maddison, Mendy, Pereira; Iheanacho. ​West Ham United ​Fabianski; Creswell, Balbuena, Diop, Zabaleta; Anderson, Noble, Rice, Snodgrass; Arnautovic, Hernandez. 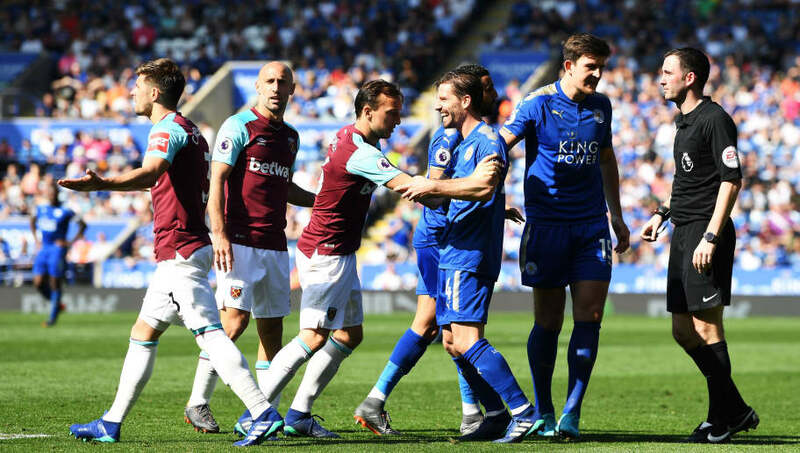 Without Jamie Vardy, Leicester might just struggle to create enough chances to win this game, but Maddison should still cause a fair amount of trouble. Alternatively, without Yarmolenko, West Ham may feel one creator short when they go forward. But, like Maddison, Arnautovic should keep the Leicester defenders pretty busy. Both teams may score, but if so, expect it to only be once.